Today on Oldest Olympians we are looking into the story of another Olympian who is certainly deceased, but for whom mystery nonetheless surrounds them: Joe Wheater, born October 6, 1918. Wheater came into competitive sport shooting somewhat later in life but, when he arrived, he wasted no time in demonstrating his prowess as being among Great Britain’s best. Over the course of his career, he won over 60 English titles, appeared in three editions of the Olympic trap shooting competition (1956, 1960, and 1964), and set a world record in clay target shooting in 1956. While his best finish at the Games was sixth in 1960, he earned several medals in the sport at the European Championships over the years. We contacted the owner of the website, Keith Coyle, who informed us that Wheater had sold his shooting grounds in the late 1990s and then retired. While living abroad in 2009, Coyle was informed by friends that Wheater had died, but unfortunately could not locate any obituaries to confirm this fact. We passed this information on to the dedicated team of researchers at the OlyMADMen, but they were unable to come up with any records concerning his death. Earlier this year, one member did locate a probate record for a Joseph Wheater who died November 24, 2011 near Leeds, but unfortunately there was insufficient information to determine that this was the Olympian, and, moreover, it did not align with Coyle’s information. 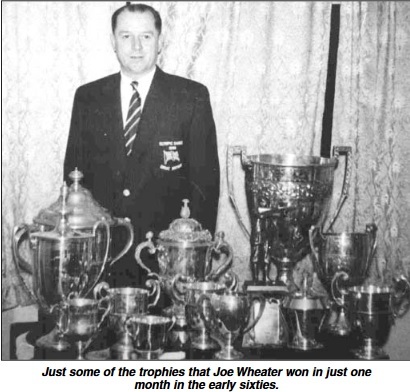 Given all of this, we are left wondering: when did Joe Wheater die and how did such a notable sportsman manage to elude everyone’s attention when he did? Many sources still list him as being alive, or as having been alive more recently than 2009, which is not surprising given that one would assume that at least one obituary would have been published for him. Until we can locate additional information, Wheater will remain among our Olympic mysteries. Today on Oldest Olympians we are focusing on the case of Canadian speed skater Leo Sylvestre, an athlete who is certainly deceased, but nonetheless presents a mystery worth raising here on our blog. Sylvestre was relatively successful on the domestic scene, but had less luck when he represented his country at the 1932 Lake Placid Olympics. He was entered in all four speed skating events at the Games, but only started in the 500 metres, where he was eliminated in round one. He continued to compete at home, but eventually settled into a career as a coach and trainer in his sport of choice. We here at Oldest Olympians believed that we had determined his fate nearly a decade ago when we discovered a report of a Mrs. Leo Sylvestre, who died while giving birth in January 1953. Mrs. Sylvestre had been in a car accident three months earlier that had taken the life of her husband. There was, however, nothing to suggest that the Leo Sylvestre mentioned in the report was the Olympian, as it was not an uncommon name. When we shared this finding, however, Arild Gjerde, a Norwegian Olympic expert, related a story he had heard “about a Canadian speed skater […] who was killed in a car crash. 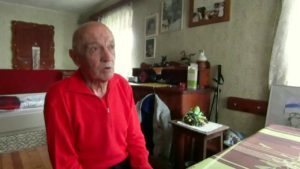 His pregnant wife was severely injured and died some times later giving birth to her child.” This seemed to be confirmation that the Leo Sylvestre in the article was the Olympic speed skater. There was just one problem. According to the Quebec Death Index, as well as research conducted by other Olympic historians, the Leo Sylvestre who died in the car accident was born January 29, 1918. While it would not be impossible for a speed skater to compete at the Olympics at the age of 14, it seemed very unlikely. Other researchers also discovered that the Olympic Sylvestre’s full name was Joseph Henry Léopold Sylvestre, and that he was born on December 14, 1912 in Montreal, Quebec. We have not been able to uncover any information about his death, although we know that he is deceased. Our research, therefore, continues, despite having uncovered enough Olympic mystery (or at least coincidence) for one speed skater’s lifetime. Today on Oldest Olympians, we are going back to looking at just one individual: Chai Hon Yam. Chai was the lone member of Singapore’s field hockey squad at the 1956 Melbourne Olympics with Chinese ancestry. Despite winning two of its three matches in the preliminary round, the nation failed to advance to the semifinals because it was in the same pool as India, the upcoming gold medalists. They then lost all three of their classification round matches and placed eighth overall. Chai was prominent in the region not only on the basis of his domestic field hockey performances, but also due to his notable career in the aviation industry. Working for Malayan Airlines (later Malaysian Airlines, after the company split to have separate airlines for Malaysia and Singapore), his contributions to engineering and technical services were key in the firm’s expansion, and he was later made an honorary member of the Association of Asian Aerospace Professionals. 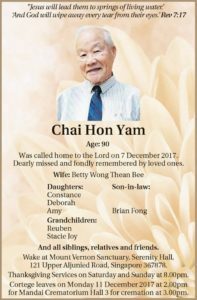 His age in the obituary would make him one year older than the Olympian, but we know that it is customary in certain cultures to begin one’s age count at one rather than zero. 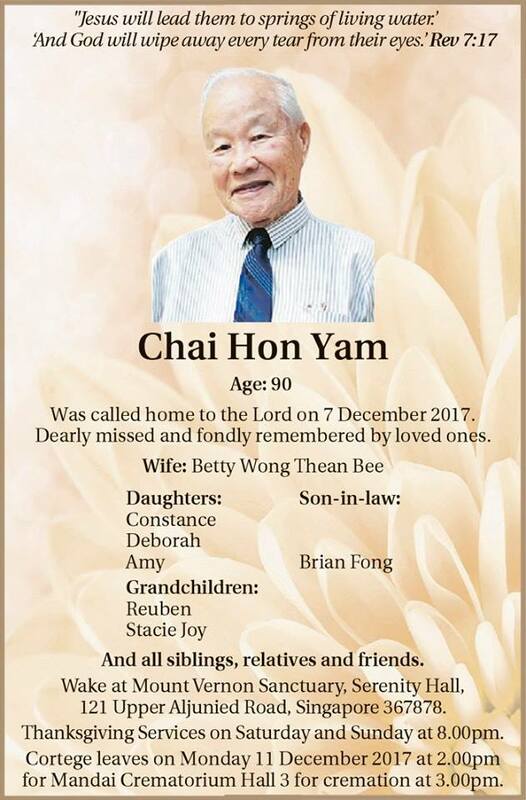 Moreover, his name is relatively uncommon and the picture in the obituary seems to resemble the Olympian from the 2014 banquet. The complication, however, is that there is no smoking gun, such as a birthdate or explicit mention of his field hockey or aviation careers, and all of our contact leads came up empty. Given that he was living recently, we would hate to mistakenly list him as deceased, as we have had cases in the past where a surprising amount of similar information about an individual turned out to be merely a coincidence. For the time being, we have elected to leave him on the list of living Olympians, but we are posting this blog as a major caveat that he may very likely be deceased. Today Oldest Olympians is bringing you part two of its coverage of Olympic missing links with 1929 births. Today we are looking at three more Olympians for whom we believed to have identified their date of death but, for whatever reason, we were unable to connect the information, such as obituary or public record, conclusively to the athlete. Zdravko Hlebanja, born October 15, 1929, was a well-known cross-country skier in Yugoslavia during the 1950s, but his most notable appearance came at the 1956 Cortina d’Ampezzo Olympics. There he finished 43rd and 42nd in the 15 and 30 km events respectively and was 13th with the national team in the 4×10 kilometers relay. Hlebanja gave an interview as recently as 2016, but the only notice of his death comes from the Slovenian Wikipedia, which lists it as March 9, 2018. Despite his recent activity, we have been unable to uncover further confirmation of this. U Sang-Gwon, born December 22, 1929, also known as Woo Sang-kwon, was a regular player with the South Korean national football team during the 1950s and the 1960s, making an appearance at the 1964 Tokyo Olympics, in which his country was eliminated in the preliminary round. He also played in the 1954 World Cup, won Asian Cups in 1956 and 1960, and took home silver from the football tournament at the 1958 Asian Games. He later had a coaching career, including a brief stint with the South Korean national team from 1970 through 1971. Both the Korean and English Wikipedias list him as having been born February 2, 1926 and dying December 13, 1975, but we have found no reliable sources to verify this information. Track and field athlete Javier Souza, born November 13, 1929, represented Mexico at the 1952 Helsinki Olympics, where he was eliminated in the opening rounds of both the 100 and 400 metres events. He had more success at other tournaments, however, winning bronze medals in the 4×100 metres relay at both the 1954 Central American and Caribbean Games and the 1955 Pan American Games. We know less about his post-sporting life, although we did find a public record entry that lists a man with the athlete’s full name, Javier Souza Díaz, born c. 1930, dying on January 7, 2005. Without any additional details or an obituary, however, we cannot confirm that this record is for the Olympian. And that is it for our quick look into Olympic missing links from 1929! Now that we are caught up with our blogging, we will be moving back to the once-a-week format, so tune in next week as we continue exploring Olympic mysteries; we hope you will join us! We here at Oldest Olympians are a bit behind in our blogging schedule, so we are going to rectify that by presenting a two-part post this weekend on the subject of 1929 missing links. Approximately two months ago, we concluded our long-running series on Olympic missing links, which looked at cases for whom we believed to have identified their date of death but, for whatever reason, we were unable to connect the information, such as obituary or public record, conclusively to the athlete. Upon completing our review of Olympians born in 1929, we discovered that there were more uncertainties to report, and we present them here not only in the hopes of solving some of these cases, but to continue our commitment to transparency in our research. Alpine skiing, as one might imagine, is not a particular high-profile sport in Iran, and thus it is not surprising that we know little of Benik Amirian, born c. 1929, aside from his Olympic participation. At the 1956 Cortina d’Ampezzo Games, he competed in all three events, placing 44th in the downhill and failing to finish either the slalom or the giant slalom. 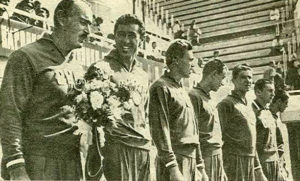 He had been a member of the national team since 1950 and continued competing at least through 1957. We located an entry in the Social Security Death Index for a Benik Amirians, born May 22, 1928, who died in Los Angeles on November 13, 2009, but there are no corroborating details to confirm that this is the Olympian. Julienne Boudewijns, born August 11, 1929, was a member of the Belgian women’s team that placed 11th and last in the all-around at the 1948 London Olympics. Like alpine skiing in Iran, gymnastics in Belgium is not a high-profile sport (the nation, for example, has not reached the Olympic podium in gymnastics since 1920) and thus her Olympic participation is the extent of what we know about Boudewijns. An individual by that name died March 12, 2014, but as the Olympian celebrated her 19th birthday during the Games, it is very much possible that she later married and changed her surname and thus, without additional details, we cannot confirm that the individual in the obituary is the same person as the Olympian. Unlike many of the other Olympians we profile here, the career of Italian track and field athlete Milena Greppi, born July 8, 1929, is well-known. 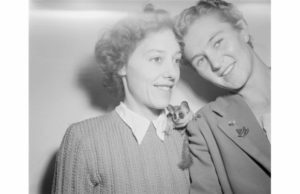 At the Olympics, she competed in both the 80 metres hurdles and the 4×100 metres relay at both the 1952 and 1956 Summer Olympics, but did not reach the podium. 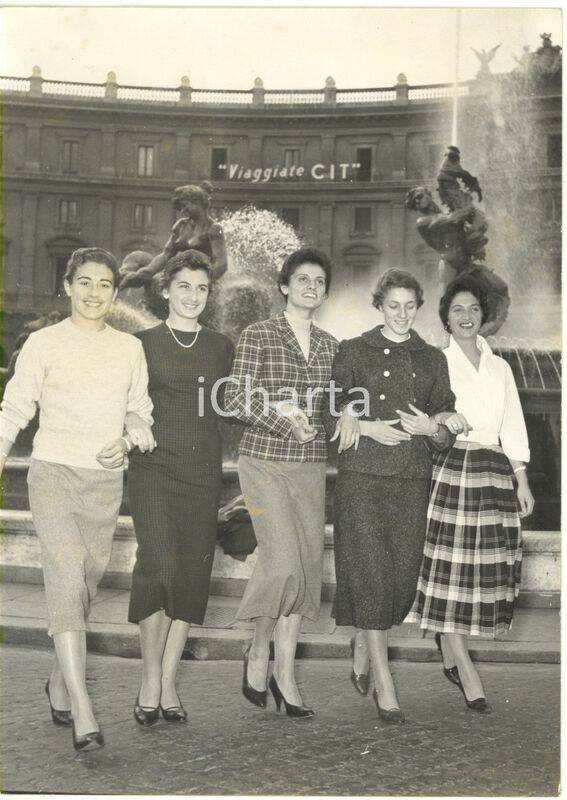 In-between, however, she took home a bronze medal as part of the Italian women’s 4×100 metres relay squad at the 1954 European Championships. She represented Italy abroad until 1958. Nationally, she won five consecutive 80 metres hurdles titles from 1952 through 1956, and also won 4×100 metres relay titles in 1953 and 1954. The Italian Wikipedia lists her as dying December 13, 2016 in Milano, but the cited obituary does not list any details connecting this individual to the Olympian, so we await further confirmation. These are the three names that we are covering today, but tune in tomorrow when we will post part two and feature three more missing links from 1929 (unless we happen to solve them in the meantime!). We hope that you will join us! It is a busy week here at Oldest Olympians, but we did not want to miss out on a quick blog post, so we decided to go a little outside of our usual field to bring you a rather unusual case. We always try to keep an eye on upcoming oldest Olympians, and in this instance something odd caught our attention. Our database indicated that Matthew Robert Best, a non-starter with the New Zealand field hockey team at the 1964 Tokyo Olympics had recently turned 80… on February 29, 2019. As February 29, 2019 does not exist, and therefore neither does February 29, 1939, we figured that this must be a simple error and followed up with the Official Report… which also listed his date of birth as February 29, 1939. 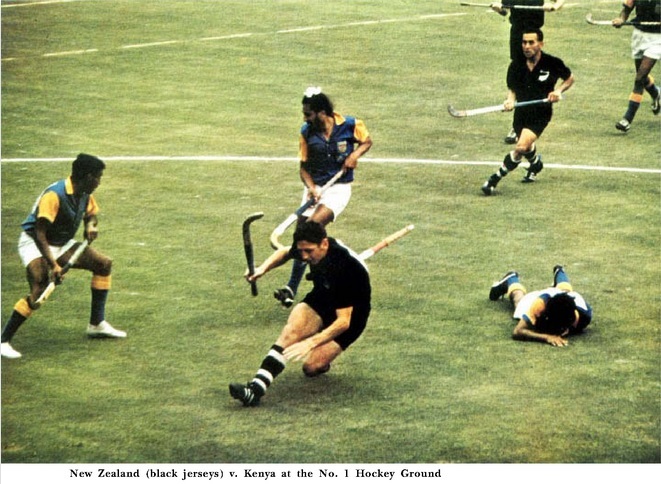 (The 1964 New Zealand field hockey team in a match against Kenya, as pictured in the Official Report). So too do the official entry lists for the Games list him with that date of birth, which leaves us with the question of what his actual birthday is. We did some searching, but unfortunately his name is so common that we were unable to find any information on him at all. Thus, while this is somewhat outside of our normal purview, we felt it to be a quirky little Olympic mystery, as well as reminder that no source, no matter how official, is infallible. Today on Olympic Mysteries, we are looking at an Olympian whose circumstances are truly deserving of the word “mystery”. Our subject for the day is Robert Samuel “Bob” Lymburne, who represented Canada in the ski jumping tournament at the 1932 Lake Placid Olympics. There, he placed 19th out of 34 starters in the normal hill. Lymburne had begun competing at the national level in 1927, but he did not attract widespread attention until after his Olympic appearance. On March 13, 1932, a month after competing at the Games, he set a world ski jumping record of 82 metres (269 feet) with a jump in Revelstoke, British Columbia. Lymburne lost his record in less than a year, but regained it in March 1933 with a jump of 87.5 metres (287 feet), and this one lasted until March 25, 1934, when it was bested by Norwegian Olympic champion Birger Ruud. Thus, unlike all of our other Olympic Mysteries, precise information about Lymburne’s death is not just unknown to us, but it appears to be unknown to anyone. We do not know the origins of this story – the earliest version we could locate was in Powder Pioneers, written in 2005, and thus we do not even know when his disappearance is alleged to have occurred (some sources state 1936, although he seems to have been still alive after that) or which woods he vanished in (as he worked for the Canadian Pacific Railway, it cannot even be assumed that it was in British Columbia). We have been waiting to regain our access to Newspapers.com, but it has not been forthcoming, and we wanted to get this blog post out today. We may, therefore, have an update on this story later this week if we are able to uncover more through a search of their news archives. For the time being, however, it remains a true Olympic Mystery. Today on Oldest Olympians we have another mystery concerning an Olympic medalist: Yevgeny Saltsyn. Saltsyn, born February 26, 1929, was a member of the Soviet water polo team that won a silver medal at the 1960 Rome Olympics. Saltsyn, however, played in only one of the team’s seven matches, their 8-2 victory over Brazil in the preliminary round. 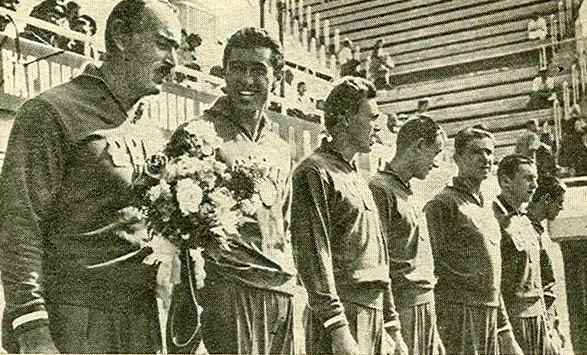 Although born in Crimea, Ukraine, he played for Caspian Flotilla’s Sports Club Baku, in what is today Azerbaijan, and, with them, won a bronze medal at the 1957 Soviet Championships. Beyond that, we do not know much about him, including whether or not he is still alive. This is likely a result of the limited time in which he actually played at the Games, as well as our own language barriers. Thus, we are reaching out to our readers with the intent of discovering more about this athlete. Hopefully this brief profile will be as fruitful as last week’s blog entry as, thanks to a comment we received on that post, we have learned that 1952 Olympic gymnastics medalist for Czechoslovakia Hana Bobková, born February 19, 1929, died in 2017. We want to extend our appreciation to Jack, who forwarded this link to us! Today on Oldest Olympians we are keeping our blog entry fairly simple. In the past, we have compiled lists of Olympic medal-winning athletes who are not known to be either alive or deceased. Today we have one more name to add to those lists: Hana Bobková. Bobková, born February 19, 1929, represented Czechoslovakia in gymnastics at the 1952 Helsinki Olympics, where she earned a bronze medal in the team all-around. She also placed joint-sixth in the team portable apparatus, while her best individual finish was 27th in the individual bars. While this was her only Olympic appearance as a competitor, she later served as a referee at the 1960, 1968, 1972, and 1980 Games. By career, she coached gymnastics. We suspect that Bobkova is still alive, given her notability, but a combination of the language barrier, as well as the fact that her married name, Vláčilová, matches that of a famous dancer, means that we have been unable to confirm this for certain. If anyone has any additional information, it would be appreciated greatly. In the meantime, thanks to a contribution from a user on Wikipedia, we have been able to solve one of our previous Olympic silver medal mysteries. Luciano Negrini, born June 22, 1920, who won a silver medal for Italy in the coxed pairs at the 1936 Berlin Games, died December 12, 2012 at the age of 92, according to a biography of his life that was published in a magazine recently. Negrini was the oldest Italian Olympic medalist about whom we had no information, and would have been the oldest living Italian Olympic medalist, ahead of fencer Roberto Ferrari, had he still been alive. With the new year well underway, we here at Oldest Olympians felt that it was time to review those Olympians whom we believe to be still alive, but may have died unnoticed over the past year. As always, we begin with those whose last confirmation of being alive is the furthest away; in this case, three individuals who were last verified living in 2008, or over 10 years ago. Should no updated confirmation be forthcoming, we would have to remove them from our main table, and thus we decided it was best to dedicate a blog entry to them in the hopes of uncovering whether or not they are still with us. Edna Maskell, born April 13, 1928, represented South Africa in the 100 metres sprint and the 80 metres hurdles at the 1952 Helsinki Olympics, and was eliminated in the second round of both events, as she was recovering from an appendix operation. She had far more success representing Northern Rhodesia at the 1954 British Empire and Commonwealth Games, however, winning the 80 metres hurdles and coming in third in the 100 yards dash. She retired from active competition shortly thereafter to live a quiet life on a farm and, although a magazine did a feature on her for her 80th birthday, we have not heard anything about her since. 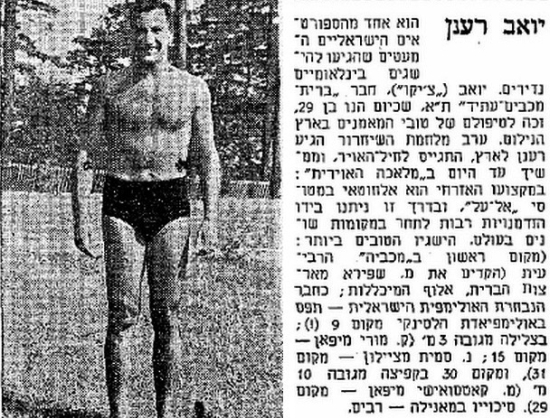 Yoav Ra’anan, born January 15, 1928, is the only diver to have represented Israel at the Olympics as of 2016. At the 1952 Helsinki Games he was 9th in the springboard and 30th in the platform, while in 1956 in Melbourne he was 22nd in the springboard and carried the national flag in the opening ceremony. 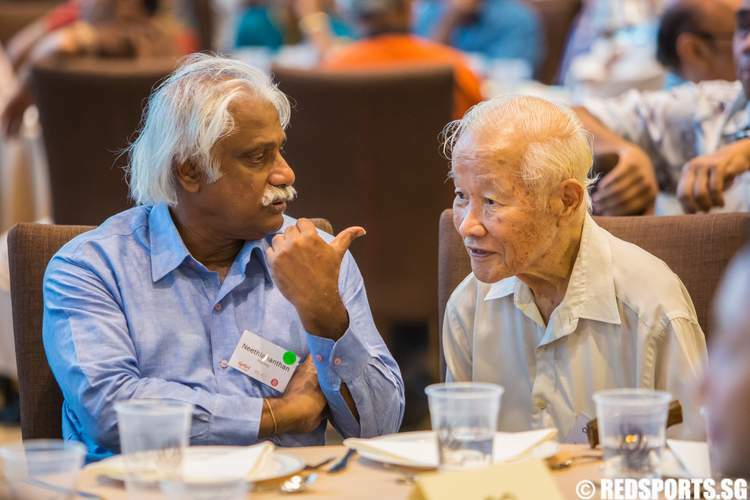 He was most successful internationally in-between these two editions, as he won gold in the springboard and silver in the platform at the 1954 Asian Games. There are many hints and suggestions on the internet that he is still alive, but the last definite confirmation that we received comes from 2008. 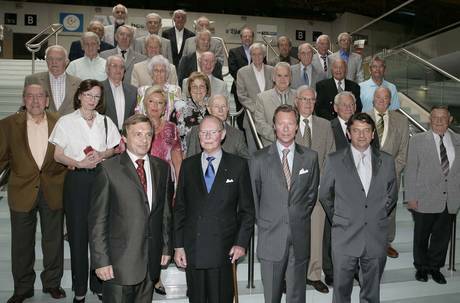 Léon Roth, born September 10, 1926, represented Luxembourg in two kayak events at the 1952 Helsinki Olympics, finishing 17th in the K-1 10,000 and being eliminated in round one of the K-2 1000. 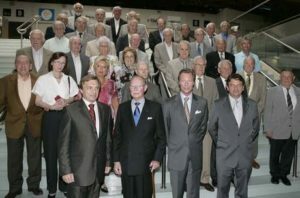 In June 2008, all surviving Luxembourgish athletes who attended the 1936, 1948, 1952, and 1956 Games were awarded the Order of Merit of the Grand Duchy of Luxembourg, which was the last time we were able to confirm that Roth was still alive. That is it for this week, but we hope that you will join us next time as we continue to blog about Olympic mysteries and explore the caveats and questions that are raised when building the most definitive list possible of the world’s oldest Olympians!